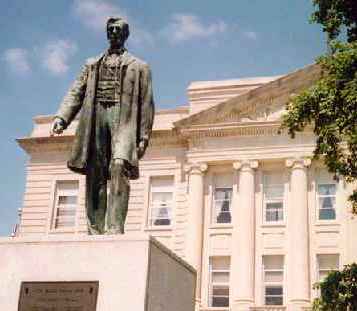 This statue by W. Granville Hastings, a native of London, appears on the Greene County Courthouse grounds. It's a replica of one at Cincinnati, Ohio, minus the figure of a kneeling woman, and honors Lincoln's Second Inaugural Address. Mr. and Mrs. S. B. Wilson presented it to Jefferson in 1918. The statue has its origins with Captain Charles Clinton of Missouri, a Union veteran and Lincoln admirer ("the greatest man that ever lived with the exception of Jesus Christ"). Captain Clinton gave a Hastings replica to Cincinnati in 1902. <Click on picture to continue.